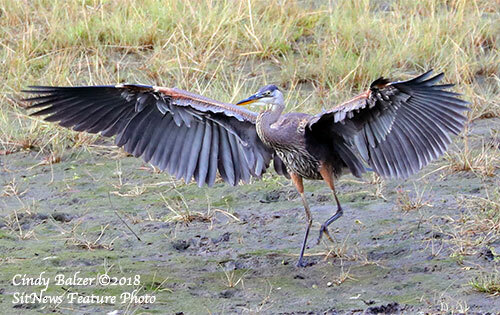 This great blue heron is showing off its amazing wingspan. Herons can have a wingspan of 5.5 to 6.6 feet making them a joy to see in flight and can cruise at 20 to 30 miles an hour. Heron are often seen standing silently along inland rivers or lakeshores, or flying high overhead, with slow wingbeats, its head hunched back onto its shoulders. This bird is highly adaptable and thrives around all kinds of waters from subtropical mangrove swamps to desert rivers to the coastline of southern Alaska. This photo was taken in the Ketchikan area. Invitation to Local Candidates: The Ketchikan Regular Election will be held on October 02, 2018. As in the past, SitNews invites all local candidates to provide a candidate's statement and include the reason you are running, experience, and issues you would like to address. Photographs are also requested. No word limits. Absentee in-person voting begins on Sept. 17, 2018. SitNews deadline to recieve statements will also be Sept. 17, 2018 - the date voting begins. Statements will be published as received. As always, this media exposure is provided as a free service to local candidates. Questions for the Candidates: Click Here to Participate in the SitNews Online Forum. Alaska: Alaska Superior Court Orders DOT&PF to clarify campaign sign laws - On Sept. 10, 2018, the Alaska Superior Court ordered the Alaska Department of Transportation & Public Facilities (DOT&PF) to clarify how laws restricting outdoor advertising will be applied during the current campaign season to political signs within and outside of state highway rights of way. The American Civil Liberties Union of Alaska (ACLU), independent expenditure group Dunleavy for Alaska, and Alaska resident Eric Siebels jointly filed suit against the State of Alaska in August seeking to immediately block enforcement of a state statute barring political signs near roadways and asking for those rules to be struck down as unconstitutional. • Unauthorized signs within state highway rights of way, including both commercial and political signs, remain illegal under AS 19.25.75-180. DOT&PF will continue to enforce this ban; any sign placed within a state highway right of way may be removed by DOT&PF crews without prior notice. • Small, temporary, political campaign signs no larger than 4’ x 8’ may be displayed on private property adjacent to state highway rights of way by the owners or occupants of that property, provided they have not been paid to display the signs. • DOT&PF will continue its current practice of not removing small, temporary, political campaign signs from private property outside highway rights of way. Lyman is the large whale entanglement response coordinator for Hawaiian Islands Humpback Whale National Marine Sanctuary. While the sanctuary coordinates and leads the effort to free whales from life-threatening entanglements, it relies heavily on tour operators, fishermen, researchers, and other members of the on-water community to help find and monitor them. That same on-water community plays a major role in monitoring the overall health of and risks to humpback whales throughout Hawaii. Lyman works closely with these groups. In parts of Alaska, like Glacier Bay National Park, they feed on huge swarms of small fish and krill throughout the summer. Then, in the winter months, they travel to the warm, shallow waters off Hawaii to mate, give birth, and raise their calves. While in Hawaii, humpback whales do not eat. There are a few good reasons for them to forgo the feasts of Alaska during the winter. Primarily, expectant mothers migrate to Hawaii‘i to reduce the risks of predation on their newborn calves. While not much will try to eat an adult humpback whale, calves are at risk of predation from orcas. In Hawai‘i, orcas are uncommon. Additionally, whales are born with a relatively thin layer of fat, or blubber. In Hawai‘i, humpback whale calves can stay warm while they nurse and produce the blubber they’ll need to survive the cold waters of Alaska. Humpback whales range throughout the world’s ocean, migrating between feeding grounds near the poles and calving grounds in tropical waters. In 1973, they were placed on the Endangered Species List, as commercial whaling had significantly reduced their numbers. The protection appears to have worked. Between 2004 and 2006, 400 researchers from 10 different countries around the world came together to establish population size and migratory patterns for the North Pacific population of humpback whales, and, as a subset of that, the Hawai‘i population. The SPLASH study (Structure of Population, Level of Abundance, Status of Humpback Whales) survey estimated that as of 2006, approximately 10,000 humpback whales utilize Hawai‘i as their breeding and calving area. The survey also indicated that the population was growing at an annual rate of 5.5 to 6.0 percent. A mother humpback whale supports her calf in the warm waters of Hawaiian Islands Humpback Whale National Marine Sanctuary. The SPLASH growth estimate seemed to be pretty spot-on in the ensuing years. Dr. Rachel Cartwright, emeritus faculty at California State University, Channel Islands, and lead researcher with the Keiki Kohola Project, conducted transect surveys in the ?Au?au Channel between Maui and L?na?i to determine where mother and calf whales were spending their time. “We had a really nice climb from 2008 to 2013,” she says, with the number of mother and calf pairs increasing over the years. What they observed tracked “with what we would have expected based on that five to six percent” estimate. As the 2015 season progressed, it became more clear to Lyman, Cartwright, and other researchers that the changes in whale sightings weren’t just a temporary fluke. Several researchers shifted their efforts and attention to investigate and quantify the changes in order to help determine what might be going on. Cartwright, for one, revisited the transects she had surveyed for the first time between 2008 and 2010 and again in 2013 and 2014. “We have random fluctuations,” she acknowledges. “But by the time we got to 2017, we were over 50 percent down from 2014” in terms of the number of different mother and calf pairs they had seen. By 2018, her team was recording an additional 35 percent drop in sighting rates for mother-calf pairs. While she was sighting adult humpback whales in similar numbers as in past surveys, she simply wasn’t seeing many new calves. Analysis: How the pain of 9/11 still stays with a generation By DANA ROSE GARFIN - The Sept. 11, 2001 terrorist attacks were the worst acts of terrorism on American soil to date. Designed to instill panic and fear, the attacks were unprecedented in terms of their scope, magnitude and impact on the American psyche. Analysis: 'Treason' is now a popular word – here's what it really means By ROBERT A. SEDLER - In the furor over the anonymous New York Times op-ed by a Trump administration “senior official,” the word “treason” has been used by a variety of people. President Trump tweeted “TREASON?” in an apparent reference to the op-ed’s author. Trump’s supporters have likewise used the word in attacks on the author – and the newspaper for printing it. Trump’s opponents have likewise bandied the word about by saying that the op-ed was not “treasonous.” Instead, they say that Trump himself is guilty of “treason” by trying to obstruct the investigation into the claimed Russian interference in the 2016 election. Earlier this year, Trump opponents also claimed he committed treason at his summit with Russian President Vladimir Putin. As a constitutional scholar, I’d like to remind people there is a precise definition of “treason” set forth in the Constitution. None of the recent charges of treason remotely fit that definition. The claims that one side or the other have committed treason are ignorant of the law. Treason is the only crime specifically defined in the Constitution. It is a heinous crime, the worst crime that can be committed by an American citizen. 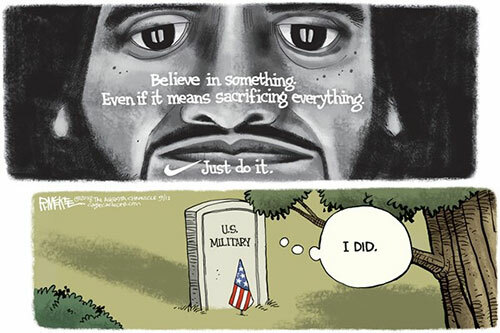 It is a betrayal of the nation and of values embodied in the American constitutional system. It can be punished by death. When the framers defined “treason” in Article III, Section 3, they were determined to avoid the use of “treason” as it had been used in English law to punish opponents of the king. In English law, “treason” meant acts of disloyalty to the king. A person convicted of “treason” was not only executed, but all of his property was “attained” – or confiscated by the government. This was not the way the crime of treason would operate in the United States, which was founded by those who had rebelled against the British king. The framers of the constitution made sure of that. TOM PURCELL: Recalling 9/11: We're Not So Divided After All - On Sept. 11, 2001, I was driving along the Beltway to a Falls Church, Va., office building when a radio announcer said a plane had flown into the North Tower of the World Trade Center in New York City. "What a horrible accident," I remember thinking. I was doing communications work for a big technology company. I parked my car and just as I was getting situated in my cubicle inside the office building, I heard the television blaring in my client's office. He told me a second plane had flown into the South Tower of the World Trade Center. Soon, we learned that a third plane had flown into the Pentagon. We took the elevator to the top floor with several others. Only 9 miles from the Pentagon, we could see smoke billowing into the sky. Radios and TVs were turned up. Local announcers were relaying reports of additional attacks, many of which would turn out to be untrue. Dulles International Airport was under attack? Reagan National Airport? The White House? The Capitol? How many more hijacked planes were out there? Where would they strike next? It was total chaos. Here I was in an impersonal office building as people cried, called loved ones, even prayed aloud. Bockhorst for Borough Assembly By Rodney Dial - Friends, I have been on the Borough Assembly for a few years now. I was convinced to run by citizens who believe our community is becoming too expensive, especially for our elderly and our young. I told you that if you elected me I would not vote to raise your property or sales taxes and would work to make government more efficient. I have kept my word. Otos for Assembly - Ketchikan needs more Borough Assembly members that are leaders who actively engage their constituents, are proactive about issues and are planning for the future. Austin Otos would be one of those assembly members. Mr. Otos is a candidate that focusses on what we ‘can’ and ‘should’ do for our community and doesn’t focus on the ‘cant’s’ like other assembly candidates. Campaign Signs By Deborah Hayden - In this campaign season so far the various factions have been not been contentious. That changed this weekend when I came home and found a “Vote No on 1” sign placed on my property without my permission. Whether I will vote no on ballot measure 1 or not has no bearing on the sign on my property. The fact is, no one asked or received permission to place the sign on my property. I removed the sign and placed it on the ground nearby. The next day, the sign was again up on my property. No one had asked for permission. I again removed the sign and put it in a place where those who kept putting it up could not access it. LiSA’S CHOICE By David G Hanger - Only two things of real consequence have emerged from the Brett Kavanaugh hearings: 1) First is the fact that Kavanaugh repeatedly lied to Congress about his criminal involvement in and use of stolen government documents during the Bush Jr. administration. These repeated lies to Congress are sufficient in and of themselves to impeach this extremist ideological cretin from his current judgeship, and definitely disqualifies him for consideration as a legitimate Supreme Court Justice; 2) There are no laws telling a man what he can do with his body, a simple fundamental fact. Yet Kavanaugh, despite his denials to the contrary (all lies) does not believe that Roe v Wade is the law of the land, and is in fact looking forward to the opportunity to overturn Roe v Wade at the earliest moment possible.